Hubbell Premise Wiring offers fiber optic materials along with cat6 cables and electrical wires for any structured cabling installation. Our fiber channel solutions deliver the bandwidth and reliability needed for mission-critical fiber optic networks. 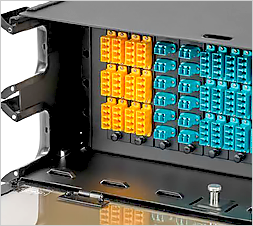 Our fiber cabling and connectivity products exceed industry standards, maximize bandwidth, and minimize cable congestion. Fiber inspection and cleaning practices are increasingly important with the rapid growth of data center connectivity. Emerging standards for fiber connector inspection and quality is driving the need for advanced cleaning products. The industry trend is moving toward mandatory inspection certification of fiber connections, and will soon be part of TIA-568 standards. Hubbell’s end-to-end fiber solutions support a wide range of cabling applications, from small building backbone to large data center infrastructure. Fiber cabling networks begin with a reliable connectivity solution, from basic field termination to high density, pre-terminated systems. 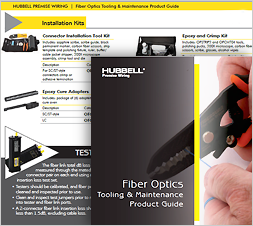 Tools and tips for stripping, cleaving, inspecting, cleaning and testing fiber optic installations.